Most people breathe incorrectly. Once into Yoga, the people get the knowledge to breathe in a correct manner. Yogic Breathing is a practice that is very important in today’s life as it helps correct poor breathing habits. In the situation of high stress or anger, the yogic breathing act as a tonic for it calm the nerves. Yogic Breathing is the combination of all three basic breathing techniques i.e. abdominal breathing, thoracic breathing, and clavicular breathing. (Please read Abdominal ( Diaphragmatic breathing ) – Thoracic breathing – Clavicular breathing). Lie in Shavasana on a Yoga mat or sit in either Padmasana or in Ardh-Padmasana if you find it difficult to sit in Padmasana. And if even Ardh-Padmasana seems difficult then sit in Sukhasana. Start inhaling and allow the breath to be deeper and slower with little or no sound of the breath. Feel the breath reaching deep into the bottom of the lungs resulting in abdominal expansion. At the end of the abdominal expansion, start to expand the chest. At the end of the chest expansion, inhale a little more until the expansion is felt around the base of the neck, near the collarbone. Some tension will be felt in the neck muscles. Upper lobes of the lungs are now also filled with the air. The whole process should be in one single intake of breath without any jerk or unnecessary strain. 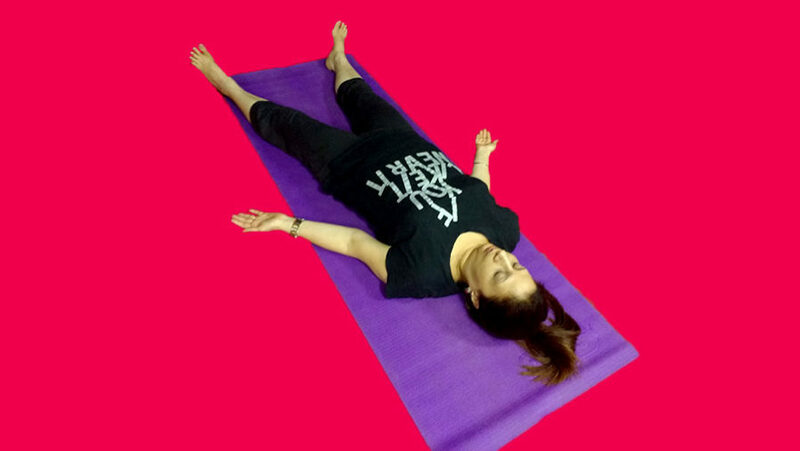 While exhaling, first relax the lower neck area and then allow the chest to contract. Try to empty the lungs by drawing the abdominal wall as close to the spine as possible. Again the whole process should be in one single exhale of breath. Hold the breath for a few seconds at the end of exhalation. This completes one round of Yogic breathing. Initially, practice 5 to 10 rounds of it and gradually increase it to 10 to 15 minutes daily. Relax and become aware of the natural and spontaneous breathing process. Become aware of the physical body and surroundings and then gradually open the eyes. Yogic breathing allows one to gain control of the breath. It helps increase oxygen intake. Regular practice of Yogic Breathing will correct and deepen the natural breathing pattern. Its practice is best recommended for a person who is stressed.